for the posts of Police Constable (FPB). Motivated and sensible appliers are suggested to go through the link available on the same article and apply online latest by final date. Only closely filled online application form is invited by using the official website of the organization and confirm that your submission. To qualify in all the rounds of selection process (ET & PST/Written Examination/ Viva-Voice) applicants will have to prepare well with the help of exam pattern and syllabus. Candidates will get attractive scale of pay after joining. More reliable details in favour of applying support for Karnataka Police Recruitment are declared below on this web page for the visitors of this web portal. To grab this opportunity apply through proper channel latest by final date. All the best to all applicants for this golden chance of jobs!! Awaited news of jobs in Karnataka State Police can be availed in the official website that is ksp.gov.in by which eager and optimistic candidates can find a new notice. For more news updates of jobs from ejobhub make bookmark this page and visit any time. Now read details and then apply today. Dear candidates read the content given below for career. Educational Qualification: Job fighters must have PUC Or equivalent qualification in science having physics, biology, chemistry, mathematics, computer science electronics as one of the subjects from a recognized University/ Institute. Age Limitation: Age of the appliers should be between 19 years to 25 years. Age relaxation will be given maximum two years if a candidate belongs to SC, ST, CAT-01, 2A, 2B, 3A & 3B and Five years if a candidate belongs to PWD category. On the home page select “current recruitment” tab available under the “citizen services section” at the bottom of the page. Now enter on the “Police Recruitment” link. Fill the online application form by entering all details. Upload with the application form your passport size photograph and documents. Make payment of application fee through proper channel. Finally enter on “Submit” option and take a hard copy of the filled application form for future use. Karnataka State Police (KSP) is going to appoint the desirable and best fit candidates for vacancies of the post constable & sub-inspector. Karnataka Police Recruitment is for all 10+2 passed and graduate Degree having applicants. Candidates need to apply online on or before last date for Karnataka State Police (KSP) vacancies of Constable & Sub-Inspector. So to get this career chance submit duly filled application form properly. Candidates, who want to make their Career in Karnataka State, may apply for Karnataka Police Recruitment because it is a superb opportunity for them. Applicants, who obtain themselves interested for any of said Post, may attend producer of selection on correct date which is prescribed mentioned below on this web page. Promising candidates should visit the official website of Karnataka State Police and receipt online application form before Apply. To apply job finders match all requirements related to post for which you are going to apply. Brave participants should download application by visiting the official website of the organization. To beat all the rounds of selection process applicants will have to prepare well to be the part of KSP. Candidates will get attractive scale of pay after joining. 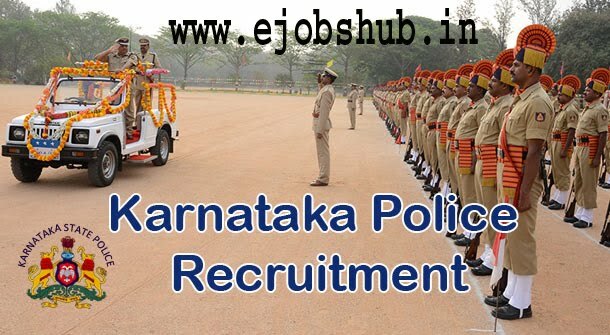 Karnataka Police Recruitment whole connectivity are issued below by the work of the members of the team of ejobhub. Dear job grabbers prepare well to pass exam and interview to join this department. More required acknowledgements in favour of Karnataka Police Recruitment are furnished below for all competent on this web page. Applicants who are keen desired for these available posts, need to get other related content in association with applying condition. 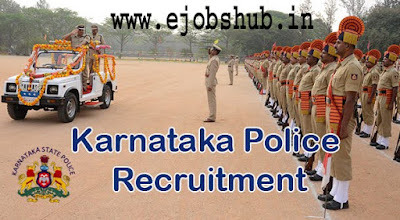 For fetching latest updates connected to Karnataka State Police Recruitment you need to keep in touch with us through this page. Other relevant highlights in support of Educational, age and salary regarding Recruitment process are mentioned below for all the visitors of this web page where you are now. Salary Info: Appointed fighters of job will be paid Rs. 20000 - 36300/-. Academic Records: Hey applicants you must be passed 10+2 and any stream graduate degree from any recognized university. Age limitations: Age of the applicants must be Minimum 21 years and Maximum age limit is 26 years. Relaxation in upper age limit is applicable for SC/ST/Ex. Serviceman/Category-I/2A/2B/3A/3B categories as per Govt. Rules. Eligible job grabbers who have good physical health need to apply only through online mode. For this first of all go to the official website of Karnataka State Police (KSP) is www.ksp.gov.in. Press on the ‘Current Recruitment’at the home page. Read the notice carefully till the end. Now start filling the application form online with all details, attachment and submit it. Submit form latest by dead line. Take hard copy for next use. Note: For more detailed information applicants may visit the Official Advertisement before apply online. H sir my question is also same..When?